Traveling to Canada was an experience. We flew from Cape Town to Johannesburg, Johannesburg to London, London to Canada, Ottawa. With about 30hours of traveling time we were dead tired upon arrival at our Hotel. With nothing else in mind I went straight to bed to try and catch up with some lost snooze time. The next day I woke up feeling somewhat refreshed and ready to acclimate. Getting onto my bike and exploring a bit of what Ottawa had to offer. Felt a bit silly “exploring” on my time trial bike and tt helmet on – receiving a few stares and glares. Soon they would see thousands more and would get used to the “look”. They have the most beautiful cycle/running paths in and around town that you could cycle and run a different route every day. I took full advantage of what Ottawa had to offer. The weather was perfect during the course of the week and on race day the wind blew like crazy. Having my tri-spoke wheels on I knew this would be tough. Also feeling sorry for those athletes with the back disk on, we all knew this would be hard work keeping our bikes up and steady. Standing at the start like, looking at all the different countries around me, everyone just as nervous. Shaking out of legs, arms and rolling of necks to make sure everything is just right and as comfortable as you can be on the start. My nerves vibrated through my entire body, I closed my eyes for a second and just exhaled with gratefulness for being able to get to this point. I never really thought I would make it to world champs so soon. I had made a dream come true. I was alive. Race started and the pace was set pretty fast. Some ran out fast and others, like me, decided to start off on a pace I knew I could build into and increase as I went on in the run. First lap was hard and into the second lap the legs felt a bit more comfortable but the winds were harsh and sometimes required you to push a bit more to not lose much pace. Coming into T1 I realised I never clipped my shoes onto my bike and had to put them on and run with then to the mount line. This completely through out my focus and I lost some place because of this. Out on the bike the fight for balance was hard. This wasn’t going to be a fast bike, having to try keep it from blowing over I had to take my arms off TT position and push down on my bars. Fighting through the bike and being blown into T2, this time it went a bit faster to transition but not much, and I was out on my final run. Legs were absolutely blown after the bike and struggled on the first 2kms into the 5km run. 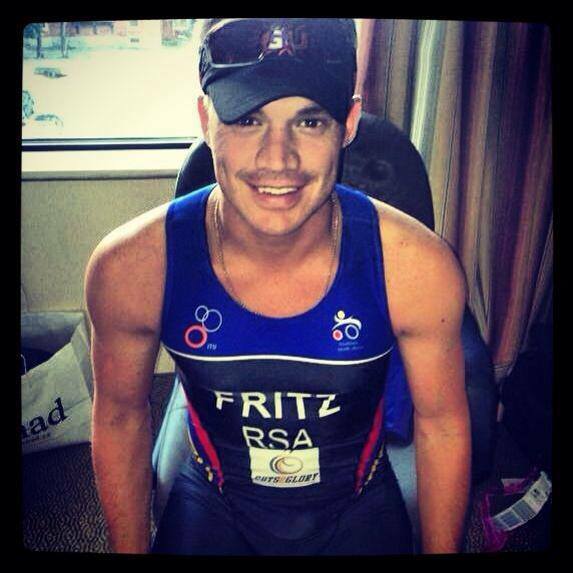 Finishing 24th position on my first ever world champs event… I was happy. I never really understood what it meant to have a bad transition time, only now I really do and will definitely be practicing a little more and be sure to double, triple check my gear. I need to thank my Coach, Neil MacPherson for knowing just how to push and get the best out of me. Through his coaching I have achieved so many goals and personal best times in various races. Our team Manager, Craig for putting up with our whining and complaining. My friends and family for always listening to me talk about races, bikes, running and so much more. I am my best through those that support and love me.